Annette (Michelle Morgan) and Elliot (Jorma Taccone) are a mostly happy, moderately neurotic L.A. couple. Maybe Annette doesn’t enjoy game nights or taco stands as much as Elliot does, but no relationship is perfect, right? Rather than embracing their differences, Annette can only compare their relationship to their happy couple friends. This cannot be endorsed by Annette’s beautiful but romantically troubled best friend, Baker (Dree Hemingway), who is very well-versed on the bleakness of the L.A. dating scene. 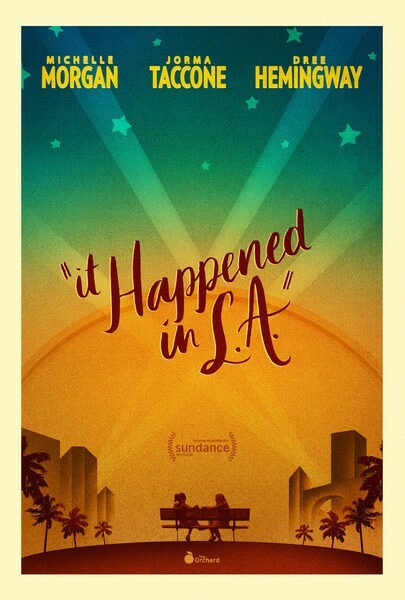 Taking its cues from classic mid-20th Century comedies with a stylish and contemporary spin, IT HAPPENED IN L.A. is an irreverent tale of life and the search for elusive love in the 21st Century.